What Happens at a #Play14 Conference? People look at me funny when I say that spent a weekend at a Play conference. Yes, we do laugh a lot, it is fun and there is a lot of learning to be had from play. #Play14 is a conference where you "develop your facilitation skills, increase your ability to accompany change in your organization, foster your creativity and improve your capacity to innovate." 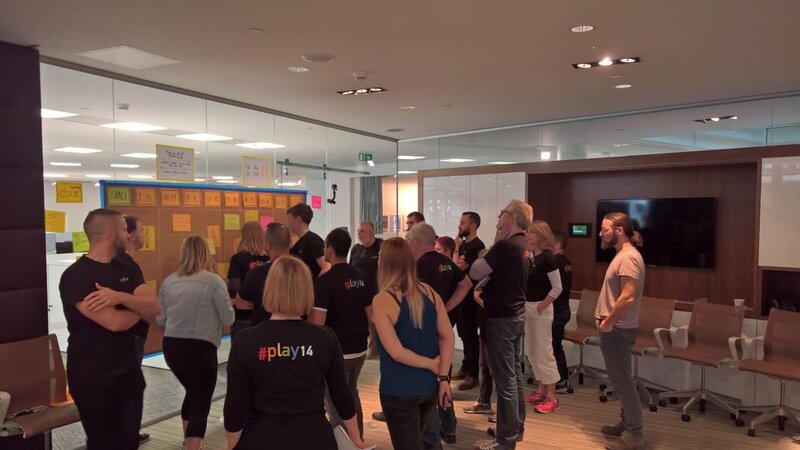 #Play14 was started in Luxembourg by a group of Agile- and Scrum Coaches (think software development) and the growing fanbase is now reaching a wider audience all over Europe. This year's London event attracted a majority of agile/scrum coaches, a scattering of executive coaches (including myself), organisational /leadership development experts and a few outliers. What unites us is our work with teams and groups and the shared philosophy that play can be the best way to learn. We kick-off the conference in an unconventional way: that is, there is no agenda until the participants contribute and build the agenda themselves. Pic: The Marketplace - creating our agenda for day 1. I'm all for a predictable, ordered and efficient environment. So it might be my love of creating order out of chaos that peeked my interest in this workshop on Complexity. Bernhard Sterchi is the founder of Palladio. Bernhard is an expert in corporate culture and leadership development and his focus is on complexity oriented leadership. Bernhard brought to #Play14 Cynefin playing cards, which he developed for teaching and coaching complexity savviness. 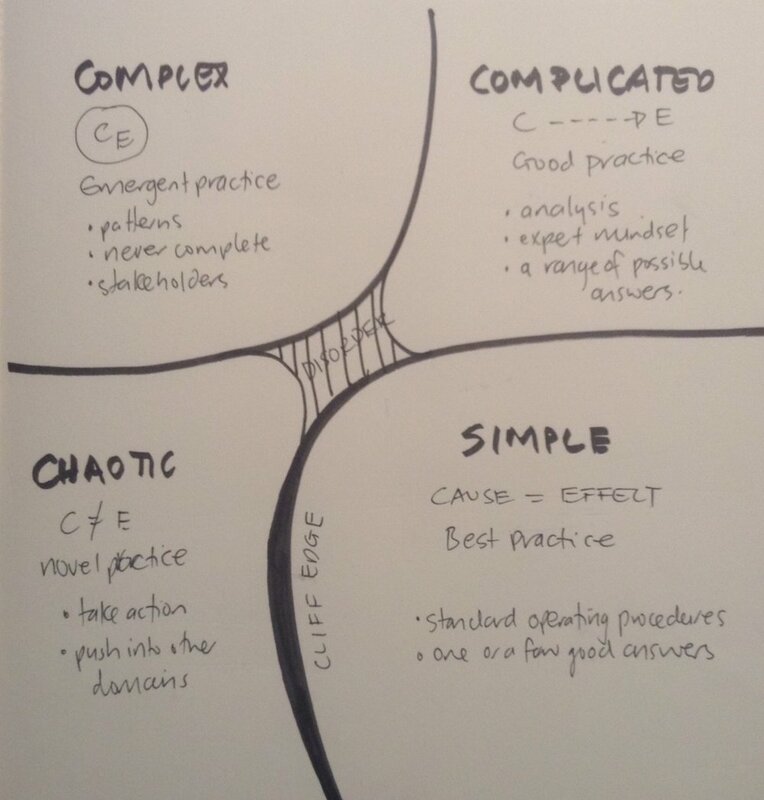 Cynefin (or Kevin Kuh-nev-in as it now sticks in my head!) is a decision making framework developed by the company Cognitive Edge that "allows executives to see things from new viewpoints, assimilate complex concepts, and address real-world problems and opportunities". The playing cards that Bernhard developed takes this learning to new more relatable level. The cards lead players through real-life scenarios, from simple to chaotic, and encouraged discussions about their relationship to the diagram. We were able to see that the differing complexity of scenarios needed different ways of solutions-thinking and responding. The cynefin playing cards are, ultimately, to help you understand the language of complexity, relate it to the real world and build the right approach to the circumstances. This framework was new to me and it has helped me develop a new perspective when framing questions around my clients challenges. To find out more about Berhnard Sterchi's workshops visit the Palladio website and for further reading on the Cynefin framework, I recommend reading the HBR article: A leaders framework for decision making. Andrea Foa' is a physical theatre practitioner, contemporary clown, martial artist and journalist. Andrea's workshop, entitled "The Physics of Space" was pitched to those of us who would benefit from more 'presence' in the workplace or who do public speaking. Despite having spoken at many events over the years and facilitated many more workshops, I am still a reluctant public speaker, so I thought this workshop might give me an added boost of confidence. Andrea warms up the group by getting us to engage more with ourselves - "less rational, more playful", he says. We laugh, move and get used to being silly. He moves us into experiencing our space - a stylish meeting room at Herman Miller's Holborn showroom. I peer inquisitively at a 70's style vase, study the spine of a Herman Miller chair (nice!) and even speak to the grille on the floor. The 'physics of space' get more interesting as we embark on a series of distance-boundary exercises: we explore the 'space' between two people; the magnetic tension in the push-pull action in the game of "Grandmothers Footsteps". Then we explore the more stressful situation for most of the attendees - the public speaking scenario. In the role of speakers, we cast an invisible net over our audience's heads. As it slowly falls we are encouraged to engage in meaningful eye contact. I am struck by how an exercise so simple can make me feel calmer, more confident. My usual anxious reaction to public speaking is exhaled with an audible sigh. Finally, my audience is engaged and I am ready to speak. We practice modulating our voices and turn counting to twenty into an art form. I realise that we are scratching the surface of our own potential as authentic and confident speakers. Upon reflection, I believe that Andrea's work aligns well with the Polyvagal Theory. This is the study of the human nervous system and the origins of brain structures. The theory has many implications for the study of stress, emotion, and social behaviour and its importance manifests in our need for safety. The body's 'social engagement system' can only be expressed when the nervous system detects the environment as safe. In other words, feeling safe helps us relate to others better and relating to others helps us to feel safe. When we are stressed, anxious, worried about talking in front of people, our bodies are hyper-vigilant: we do not feel safe. Even neutral faces feel judgemental, eye contact is minimal, you speak in a monotone, confidence is low, the audience is not engaged. Social engagement behaviours - for example, making eye contact, modulating the voice and listening to people - require that we give up our hyper-vigilance. Andrea's workshop explored and developed our safety within the context of space, by using the voice and body. An experiential learning experience, it was successful in helping the attendees feel more confident and in control. You can find out more about Andrea Foa' and his work on his website. In summary, my experience of #Play14 was fun, but also a great learning event. I also acted silly, laughed a lot, learnt something about myself and made some great friends. I recommend attending for anyone involved in working with teams and groups and are interested in new ways of accelerating their learning, dialogue, and collaboration. New events are popping up all over Europe so do check out the #Play14 Events page for details. Presence in the Workplace: Master the physics of authentic, effective communication. Your “presence” affects everything you do. It is your presence that dictates whether the meticulous work you've put into your design will engage the client. It is your presence that will decide whether your team will share your vision and help you realise it. It is your presence that affects how effectively you can stand up to a colleague who has treated you unfairly. It is your presence that will have an impact on whether you do well in the interview or secure your promotion. It's not what you say, but how you say it. To register your interest please contact either karen@sleepinggiant-consulting.com or andrea.foa@gmail.com and be the first to know once the date is finalised.